Humidity is the amount of water vapor in the atmosphere caused by condensation and evaporation. It can be measured as absolute humidity (the amount of water vapor in a unit volume of air), or as relative humidity (the ratio of moisture in the atmosphere to the maximum moisture the atmosphere can hold). It is what gives you that horrible sticky feeling on a hot day - we feel most comfortable with relative humidity between 30% and 60%. On dry weather conditions, the scales mark zero. However, as the moisture in the air increases - and the weight of the hygroscopic substance rises accordingly -, the scales will tip towards the pan where the hygroscopic substance is. 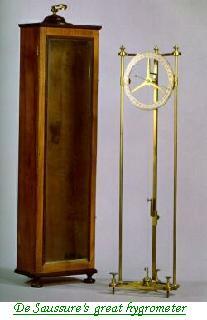 Francesco Folli invented a more practical hygrometer in 1664. 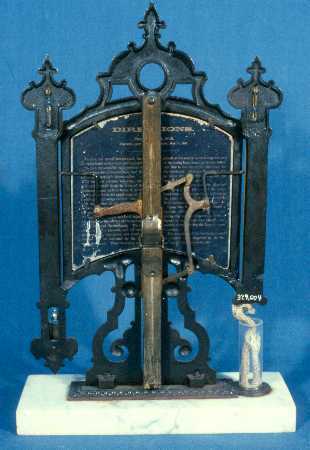 This type of hygrometer was a brass frame, in the shape of a finely decorated balustrade, carries a small roll at each end, on which is wrapped the end of a paper (now missing) ribbon serving as a hygroscopic substance. The center of the frame holds a decorated brass dial fitted with a circular graduated scale. The dial is integral with a pointer that, by means of a simple mechanical system, indicates the changes in ribbon length due to the variations in atmospheric humidity. Other kinds of hygrometers use human hair (blond) to determine moisture content. These based on the principle that organic substances ( human hair) contract and expand in response to the relative humidity. The contraction and expansion moves a needle guage. In 1783, Swiss physicist and geologist, Horace Bénédict de Saussure built the first hygrometer using a human hair to measure humidity. 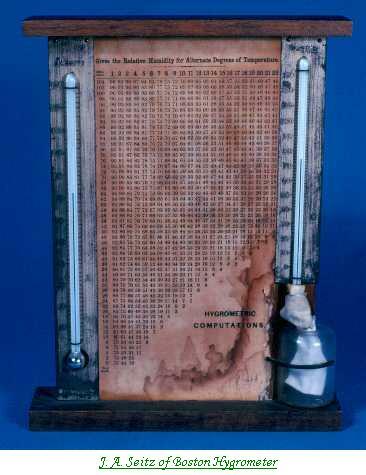 The hair hygrometer is an instrument that measures the humidity in the air (hygrometric grade). It was a type of instrument that was used widely in its time, although it was not very precise. All hair hygrometers can be considered as being derived from that of Horace-Benedict de Saussure. 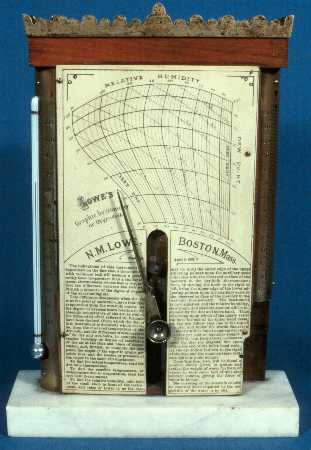 In this specimen, the hygrometer is inside a wooden case with a glass door, in which a mercury thermometer with a scale from -20°C to +35°C. The instrument can be hung on the wall with a hook. 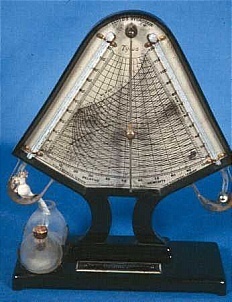 The Saussure hygrometer in the Gabinete de Física was constructed in Coimbra. The following inscription can be seen on it, identifying the maker: J.J. Miranda, Coimbra. The apparatus is protected by a wooden box which has a wooden - framed glass door at the front. Its operation was based on the dilation of a strand of hair under tension, when the humidity of the air was increased. 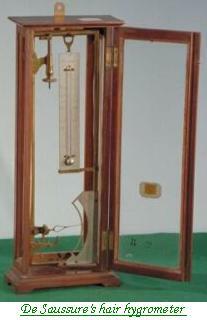 The hygrometer has three vertical shafts, two being cylindrical and the third quadrangular. The cylindrical shafts are in the front part of the apparatus and support a circular ring 8 cm in diameter, on which a scale is engraved. This scale is divided into 360 divisions marked from 0 to 360. Each division is subdivided into 10 parts. Together with the pointer, a horizontal axle installed between the scale ring and the rear shaft, moves. On this axle, next to the face of the dial, is a threaded worm-screw, on which the strand of hair is wound in order to regulate its length. The tension on the strand of hair can be adjusted through the action of a cord wound on the axle of the pointer. The other end of this cord is fixed on a metallic piece that enters a little cylindrical tube which is narrow inside. This cylindrical tube can move along the vertical shaft of the quadrangle, being placed in a position that keeps the strand of hair under tension. The hygrometer is calibrated by taking the two extreme situations as a reference: that of saturation by water and that of complete dehydration. For the first case, the hygrometer is placed with a receptacle of water, and covered by a glass bell jar. The dry condition is obtained by putting the apparatus under the bell jar with calcium carbonate or lime. Some hygrometers use the measurements of changes in electrical resistance, using a thin piece of lithium chloride or other semiconductor devices and measuring the resistance which is affected by humidity. A hygrometer is an easy to use tool for measuring the amount of humidity in the atmosphere. There are two main types of hygrometers – a dry and wet bulb psychrometer and a mechanical hygrometer. 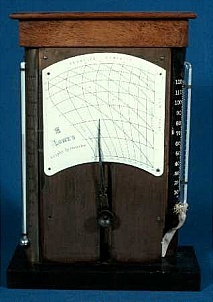 Psychrometer, one of many instruments used for measuring the water vapor content or relative humidity of the atmosphere. It consists of two identical thermometers—the wet-bulb thermometer, so called because its bulb is covered with a jacket of tight-fitting muslin cloth that can be saturated with distilled water; and the dry-bulb thermometer. When the cloth is soaked and the thermometers are properly ventilated, the wet-bulb temperature will be lower than the dry-bulb temperature (actual air temperature) because of cooling due to the evaporation of water from the cloth. The drier the air is, the greater the evaporation and thus the more the wet-bulb temperature is depressed. Psychrometric tables, list various humidity variables, such as relative humidity, according to dry-bulb temperature and wet-bulb depression at equilibrium. 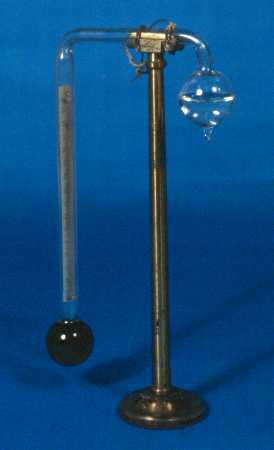 Ventilation is provided by whirling the thermometers at the end of a chain (sling psychrometer) or by a suction fan (aspiration psychrometer). Newer psychrometers use special electronic sensors. where psat,w is saturated vapour pressure at the wet-bulb temperature. Finally, saturated vapour pressure at dry-bulb temperature (i.e. normal ambient temperature) must be calculated, and the pressure ratio gives relative humidity. This sample table gives the approximate relative humidity directly from the reading of the air temperature (dry bulb) (t oC) and the wet bulb (T oC). It is computed for a pressure of 74.27 cm Hg. Errors resulting from the use of this table for air temperatures above 10oC and between 77.5 and 71 cm Hg will usually be within the errors of observation. 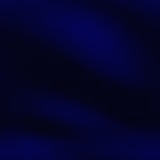 -10 93 87 80 74 67 61 54 48 41 35 28 22 16 9 .. .. .. .. .. .. .. .. .. .. .. .. .. .. .. .. .. .. .. ..
-9 94 88 81 75 69 63 57 51 45 39 33 27 21 15 9 .. .. .. .. .. .. .. .. .. .. .. .. .. .. .. .. .. .. ..
-8 94 88 83 77 71 65 60 54 48 43 48 43 37 32 26 20 15 10 .. .. .. .. .. .. .. .. .. .. .. .. .. .. .. ..
-7 95 89 84 78 73 67 62 57 52 46 41 36 31 25 20 15 10 5 .. .. .. .. .. .. .. .. .. .. .. .. .. .. .. ..
D -6 95 90 85 79 74 69 64 59 54 49 45 40 35 30 25 20 15 11 6 .. .. .. .. .. .. .. .. .. .. .. .. .. .. ..
R -5 95 90 86 81 76 71 66 62 57 52 48 43 39 34 29 25 20 16 11 7 .. .. .. .. .. .. .. .. .. .. .. .. .. ..
Y -4 95 91 86 82 77 73 68 64 59 55 51 46 42 38 33 29 25 21 17 12 .. .. .. .. .. .. .. .. .. .. .. .. .. ..
-3 96 91 87 82 78 74 70 66 62 57 53 49 45 41 37 33 29 25 21 17 8 .. .. .. .. .. .. .. .. .. .. .. .. ..
B -2 96 92 88 84 79 75 71 68 64 60 56 52 48 44 40 37 33 29 25 22 12 .. .. .. .. .. .. .. .. .. .. .. .. ..
U -1 96 92 88 84 81 77 73 69 66 62 58 54 51 47 43 40 36 33 29 26 17 8 .. .. .. .. .. .. .. .. .. .. .. ..
L 0 96 93 89 85 81 78 74 71 67 64 60 57 53 50 46 43 40 36 33 29 21 13 5 .. .. .. .. .. .. .. .. .. .. ..
B 1 97 93 90 86 83 80 76 73 70 66 63 59 56 53 49 46 43 40 36 33 25 17 10 .. .. .. .. .. .. .. .. .. .. ..
2 97 93 90 87 84 81 78 74 71 68 65 62 59 55 52 49 46 43 40 37 29 22 14 7 .. .. .. .. .. .. .. .. .. ..
T 3 97 94 91 88 84 82 78 76 72 70 67 64 61 58 55 52 49 46 43 40 33 26 19 12 5 .. .. .. .. .. .. .. .. ..
H 4 97 94 91 88 85 82 79 77 74 71 68 65 62 60 57 54 51 48 46 43 36 29 22 16 9 .. .. .. .. .. .. .. .. ..
E 5 97 94 91 88 86 83 80 77 75 72 69 67 64 61 58 56 53 51 48 45 39 33 26 20 13 7 .. .. .. .. .. .. .. ..
R 6 97 94 92 89 86 84 81 78 76 73 70 68 65 63 60 58 55 53 50 48 41 35 29 24 17 11 5 .. .. .. .. .. .. ..
M 7 97 95 92 89 87 84 82 79 77 74 72 69 67 64 62 59 57 54 52 50 44 38 32 26 21 15 10 .. .. .. .. .. .. ..
O 8 97 95 92 90 87 85 82 80 77 75 73 70 68 65 63 61 58 56 54 51 46 40 35 29 24 19 14 8 .. .. .. .. .. ..
M 9 98 95 93 90 88 85 83 81 78 76 74 71 69 67 64 62 60 58 55 53 48 42 37 32 27 22 17 12 7 .. .. .. .. ..
E 10 98 95 93 90 88 86 83 81 79 77 74 72 70 68 66 63 61 59 57 55 50 44 39 34 29 24 20 15 10 6 .. .. .. ..
T 11 98 95 93 91 89 86 84 82 80 78 75 73 71 69 67 65 62 60 58 56 51 46 41 36 32 27 22 18 13 9 5 .. .. ..
E 12 98 96 93 91 89 87 85 82 80 78 76 74 72 70 68 66 64 62 60 58 53 48 43 39 34 29 25 21 16 12 8 .. .. ..
R 13 98 96 93 91 89 87 85 83 81 79 77 75 73 71 69 67 65 63 61 59 54 50 45 41 36 32 28 23 19 15 11 7 .. ..
14 98 96 94 92 90 88 86 84 82 79 78 76 74 72 70 68 66 64 62 60 56 51 47 42 38 34 30 26 22 18 14 10 6 ..
16 95 90 85 81 76 71 67 63 58 54 50 46 42 38 34 30 26 23 19 15 12 8 5 .. .. .. .. .. .. .. .. .. .. .. ..
17 95 90 86 81 76 72 68 64 60 55 51 47 43 40 36 32 28 25 21 18 14 11 8 .. .. .. .. .. .. .. .. .. .. .. ..
18 95 91 86 82 77 73 69 65 61 57 53 49 45 41 38 34 30 27 23 20 17 14 10 7 .. .. .. .. .. .. .. .. .. .. ..
D 19 95 91 87 82 78 74 70 65 62 58 54 50 46 43 39 36 32 29 26 22 19 16 13 10 7 .. .. .. .. .. .. .. .. .. ..
R 20 96 91 87 83 78 74 70 66 63 59 55 51 48 44 41 37 34 31 28 24 21 18 15 12 9 6 .. .. .. .. .. .. .. .. ..
Y 21 96 91 87 83 79 75 71 67 64 60 56 53 49 46 42 39 36 32 29 26 23 20 17 14 12 9 6 .. .. .. .. .. .. .. ..
22 96 92 87 83 80 76 72 68 64 61 57 54 50 47 44 40 37 34 31 28 25 22 19 17 14 11 8 6 .. .. .. .. .. .. ..
B 23 96 92 88 84 80 76 72 69 65 62 58 55 52 48 45 42 39 36 33 30 27 24 21 19 16 13 11 8 6 .. .. .. .. .. ..
U 24 96 92 88 84 80 77 73 69 66 62 59 56 53 49 46 43 40 37 34 31 29 26 23 20 18 15 13 10 8 5 .. .. .. .. ..
L 25 96 92 88 84 81 77 74 70 67 63 60 57 54 50 47 44 41 39 36 33 30 28 25 22 20 17 15 12 10 8 .. .. .. .. ..
B 26 96 92 88 85 81 78 74 71 67 64 61 58 54 51 49 46 43 40 37 34 32 29 26 24 21 19 17 14 12 10 5 .. .. .. ..
27 96 92 89 85 82 78 75 71 68 65 62 58 56 52 50 47 44 41 38 36 33 31 28 26 23 21 18 16 14 12 7 .. .. .. ..
T 28 96 93 89 85 82 78 75 72 69 65 62 59 56 53 51 48 45 42 40 37 34 32 29 27 25 22 20 18 16 13 9 5 .. .. ..
H 29 96 93 89 86 82 79 76 72 69 66 63 60 57 54 52 49 46 43 41 38 36 33 31 28 26 24 22 19 17 15 11 7 .. .. ..
E 30 96 93 89 86 83 79 76 73 70 67 64 61 58 55 52 50 47 44 42 39 37 35 32 30 28 25 23 21 19 17 13 9 5 .. ..
R 31 96 93 90 86 83 80 77 73 70 67 64 61 59 56 53 51 48 45 43 40 38 36 33 31 29 27 25 22 20 18 14 11 7 .. ..
M 32 96 93 90 86 83 80 77 74 71 68 65 62 60 57 54 51 49 46 44 41 39 37 35 32 30 28 26 24 22 20 16 12 9 5 ..
O 33 97 93 90 87 83 80 77 74 71 68 66 63 60 57 55 52 50 47 45 42 40 38 36 33 31 29 27 25 23 21 17 14 10 7 ..
Humidity is the amount of moisture or water vapour in the air. You, your family, and your pets produce moisture when you breathe or perspire. Even your indoor plants produce moisture. We add water vapour to indoor air through routine household activities: cooking, showering, bathing, doing laundry, and dishwashing. And more moisture can enter your home from the surrounding soil through a basement or crawl space. When is Humidity a Problem? We need humidity for our comfort and health. But too much or too little humidity can produce a host of difficulties for householders. Some of the problems are no more than nuisances; others could be far more serious. Many are familiar to Canadians, often occurring during the heating season when it is very cold outside, our windows are closed, and indoor air circulation and ventilation are reduced. Typical Symptoms Condensation on windows. Chapped skin and lips. 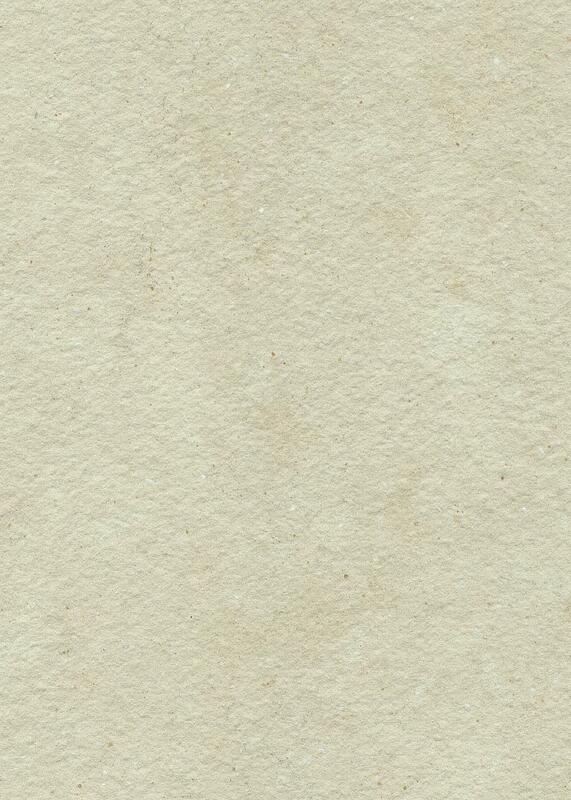 Wet stains on walls and ceilings. Scratchy nose and throat. Musty smells. Static and sparks. Allergic reactions Problems with electronic equipment. Long-Term Effects Damage to the house and contents. Continuing discomfort. Ongoing allergies. Damage to furniture and other items. A small, inexpensive and easy-to-use instrument called a hygrometer (sometimes referred to as a humidity sensor or relative humidity indicator) can measure the humidity level in your house and confirm whether the house has too much or too little humidity. Once you know for sure, you can decide whether any action is required and, if so, what to do. Hardware stores, department stores, building supply stores and electronics stores often carry hygrometers. In fact, hygrometers are usually sold wherever you would buy a room thermometer. Hygrometers and room thermometers are often combined into a single piece of equipment. You should make sure that your hygrometer provides accurate readings. The technical term for this is calibration. When you calibrate your hygrometer, you are testing its accuracy by comparing it with an independent standard. Humidity: How Much Is Too Much, Or Too Little? Experts have developed rules of thumb to help homeowners make decisions regarding humidity levels in their houses. The limits should be used as guides only. Acceptable or comfortable humidity levels will actually vary from season to season, from house to house, and even between rooms in the same house. The recommended indoor RH is 30 per cent to 50 per cent. When it is below -10oC outdoors, the recommended indoor RH is 30 per cent. Humidity can be controlled. If the relative humidity in your home is too high, you can reduce it; if it is too low, you can increase it. This may require simple changes in your family's habits, such as remembering to open or close doors or windows. Or you may need to install equipment, such as exhaust fans in bathrooms or kitchens, to remove excess humidity. Very low indoor RH levels in winter may be due to cold, dry air leaking in from outside. Sealing up the house by weatherstripping and caulking will improve humidity conditions indoors, and may reduce your heating bills at the same time. Humidifiers — both stand-alone appliances and devices attached to your furnace — can be useful for increasing indoor RH levels. But remember that humidifiers, if not installed, used and maintained properly, can also be sources of excessive moisture and mold in your home. 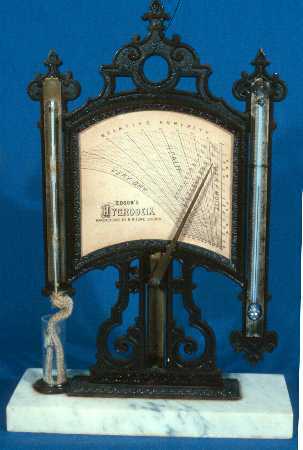 As you can see at the pictures bellow, the hygrometer at the middle, by J. A. Seitz of Boston, has a built-in table. When this table is elaborated into a nomagraph, the device is called a Hygrodeik. 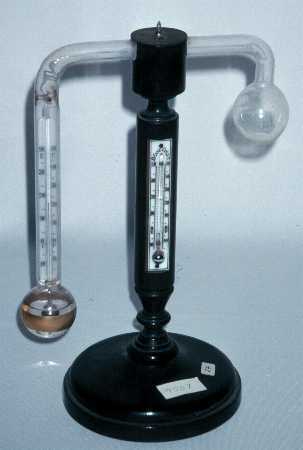 At the left is a hygrometer marked U. S. Weather Bureau, and the instrument at the right is Mason's Hygrometer, made by Green of New York. The wick around the wet bulb was supplied with water from the bottom of a (missing) glass tube, which was held by the two clips in the center of the instrument. 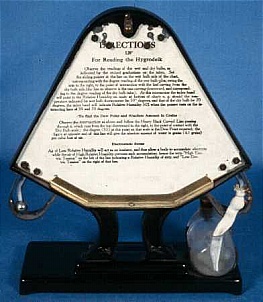 The Hygrodeik is used to measure relative humidity. 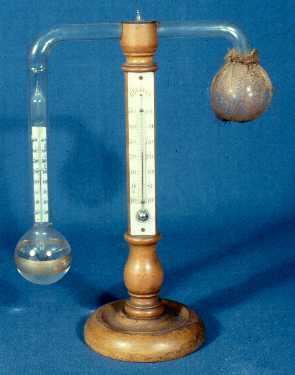 Like the Hygrometer , it uses wet and dry bulb thermometers. However, it has a nomograph which enables the user to set the wet and dry bulb temperatures and then read off the relative humidity.